You do everything in your ability to keep your child safe, while at the same time your child seems dead-set on putting themselves in harm's way. For those wondering what it's like to have kids, that — plus laundry — is parenting in a nutshell. And while we can be diligent about car seat safety, baby proofing, and even make sure the toys they play with are safe, one of the most deadly dangers to young children is probably lurking in a cupboard, bag, or shelf in your home right now. We're talking about medication, whether it's that travel container of Advil in your purse, the cough syrup in your bathroom, the vitamins you keep in the cupboard, or the bottle of baby Tylenol you keep in the diaper bag. Your curious child will find it. And, as they tend to do, they will put it in their mouth. "Medication is the leading cause of poisoning in children. Even small amounts of adult medication can be fatal to your child," Pamela Fuselli, Vice President at the injury prevention charity Parachute Canada, told HuffPost Canada in an email interview. In Canada, there are about three deaths per year in children aged 14 and younger from unintentional poisoning (which includes other household products such as cleaners), according to the Public Health Agency of Canada. Another 900 are hospitalized with serious injuries. 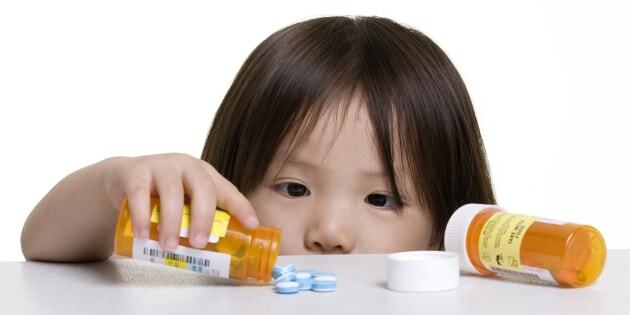 In 2013, about 60,000 kids were seen in emergency rooms for medication poisonings, according to Safe Kids Worldwide. Younger kids (such as birth to age five), have the highest rates of hospitalization from poisoning, Fuselli said. But the vast majority of poisoning cases are handled by Canada's poison control centres, she added. The Ontario Poison Centre alone deals with 100,000 calls per year, Fuselli said. "Fortunately, deaths from poisoning are rare, only a handful occurring each year," Fuselli said. Despite being aware of the risks, nearly 70 per cent of parents with children under the age of six say that they often store medication within a child's sight, such as on a shelf, Safe Kids Worldwide said in a 2017 report. Four in 10 parents said they think it's OK to keep medications they or their child take every day on a kitchen counter or other visible location so it's more handy, according to the report. And half of the parents surveyed said that when a child is sick it's OK to keep the medication out for convenience. But in three out of five accidental child poisoning cases involving medication, the medicine isn't stored in its "usual" place and is therefore more accessible, Safe Kids Worldwide said. "These results suggest a pressing need to educate parents further on why 'up and away and out of sight' every time is so important and what it really means, particularly when so many parents are still choosing to keep medicine visible and handy for convenience sake or as a memory aid," the report said. In about half of over the counter medication poisonings, the child climbed on a chair or toy to reach the medicine, Safe Kids Worldwide said. And about half of accidental child poisonings involved child-resistant packaging. Keep all potential poisons locked up and out of reach of children, Fuselli said. "Place all medications in a locked box and put it in a place that is high up and out of your child's reach," she added. And tell guests in your home to do the same, Fuselli added. "When visitors come to your home, make sure they keep their purses, bags, etc. out of your child's reach. Visitors may have unsafe and dangerous products with them. Keep their belongings out of your child's reach just as you do your own," Fuselli said. Never, ever refer to medicine as "candy," she said. Even children's vitamins, which can look and smell like a tasty treat, can be harmful if eaten in large doses, she added. And keep all medication in its original, child-resistant packaging, Parachute Canada said on their website (but don't trust that the packaging alone will keep a child out of harm's way). "Keep the number of your local poison control centre number near the phone," Fuselli said. In the case that your child swallows something he or she shouldn't, contact a poison centre, she added. If there isn't one in your province or territory, dial 911. Hold onto the container that the medication came from so that a medical professional can see the ingredients and the quantity, she added. "The best way to protect children from unintentional poisoning is through prevention. However, sometimes despite our best intentions children still manage to get into things. In these instances it is important to know the number of your poison control centre and phone immediately to find out what to do,"Dr. Debra Kent, Clinical Supervisor, B.C. Drug and Poison Information Centre, said in a 2015 Health Canada news release.